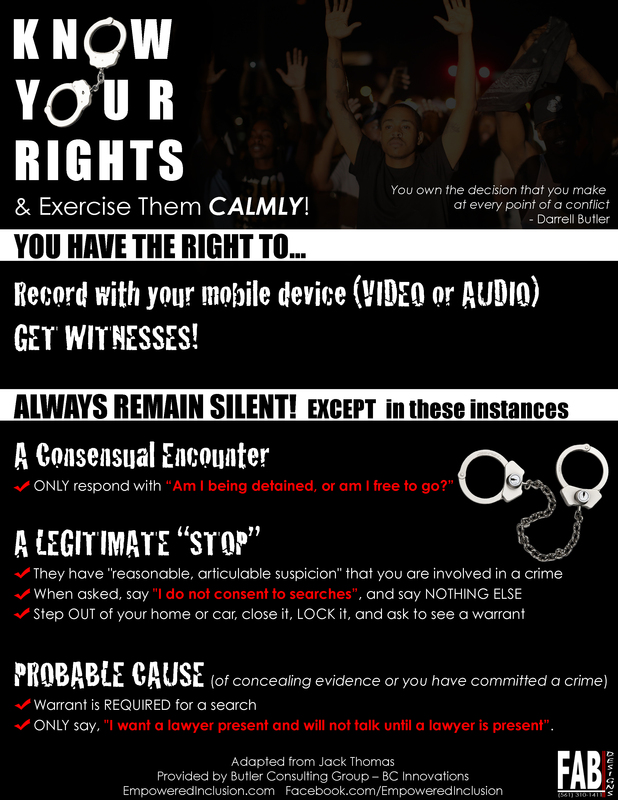 Know Your Rights…And Exercise Them CALMLY! In light of growing reported incidents of police encounters ending in unnecessary violence, one of my fraternity Brothers forwarded some valuable tips on the rights we have as United States citizens. I had those tips by Brother Jack Thomas summarized in this image for easy sharing and recall. Brother Thomas’ full memo follows. Here is an example of calmly exercising your rights. These tips will not guarantee a positive outcome in all situations, but they can certainly increase the probability of safer results and more law enforcement accountability. Please share this information as a courtesy to your loved ones that may find themselves unexpectedly on either side of a conflict. I’ve been extremely disturbed by recent publicized events involving regular interactions African Americans have had with the police. Thus, mindful of the number of young brothers in our Bond, I’ve decided to take this opportunity to explain your rights when interacting with the police. They are your rights! They are personal! Blood has been shed, here and abroad, to protect them. Don’t just give them away in a street encounter with the police. In each of these situations, you need witnesses and evidence more than you need friends. If you are in the company of other, before the police reach you, tell them to remain calm, to pay particular attention to what is said and done, and to call to alert outsiders to where you are and what is happening. Turn the recorder on your smartphone on. You should also tell your companions to record what is happening. One has a right to make a video recording of a public official, though the police might try to convince you differently. Often, they erroneously assert some fabricated privacy right. They have none while performing an official function. If your friend is too afraid to make a video, as the police are approaching you, tell your friend to make an audio recording. Evidence is what will ultimately rule the day. You should know that, as a matter of Constitutional law, there are three levels of police encounter. First, there is a consensual encounter. The police need no particular reason to approach and talk with you. You, however, are in control of the encounter. It lasts only so long as you consent to a restriction of your ability to walk away or to remain silent. Remember, no matter the nature of the encounter, you have an absolute right to remain silent, which, with three exceptions, is probably your best bet. In consensual encounters, you are under no obligation to stop, talk with the police, or provide the police with any identification or explanation. Thus, you should respond to any police encounter and request for your identification by asking, “Am I being detained or am I free to go?” That is the first exception to the general rule that your best bet is to remain silent. There is never a time when a police officer is doing anything other than his job. Even when being friendly, the police are always trying to learn as much about you as they can. You have a right to your privacy, as long as you protect it. If you are free to go, exercise that right and leave. If the police inform you that you are being detained, that necessarily means that they believe they have “reasonable, articulable suspicion” that you are involved in a crime. This is what the law considers a legitimate “stop,” which means you are not free to leave. In these situations, the police can legitimately demand identification, and you must provide it: particularly, if you are operating a motor vehicle. The police have the right to determine who you are and whether you enjoy the privilege of driving. If the police have an additional reason to believe that you are armed, they may pat down the outer surfaces of your clothing for their own safety. Typically, the police will ask whether you consent to such an intrusion. This is the second exception to the rule of silence. You should always tell the police, “I do not consent to searches.” No matter what the police do, say nothing else. If you are in an automobile, and are asked to step out, you should open the door, roll up the windows, exit the vehicle, and lock the car. The police have a right to look into any area which you make available to public view and, when concerned about their safety, to reach into any area into which you might reach for a weapon. This rule of come out and lock the door also applies to your home. Never invite the police into your home: no matter how friendly they are! The police cannot enter your home without having a search warrant with them. When they have a search warrant, they should give you a copy of it before executing a search. Don’t just let the police waive some papers around and tell you they have a warrant. Demand a copy of the warrant! If the police come to your house wanting to talk with you, get your keys, step outside, lock the door behind you, and see what they have to say. Remember, it is your Constitutional right to remain silent. Ask whether you are being detained or are free to go. If free to go, listen to them as long as you’d like, say nothing, thank them for coming, and tell them that you’re sorry but you’re busy and now need to go. Thirdly, unless you consent, the police may only conduct a full blown search of your property or person — e.g., enter your home, reach into your pockets, search your car or home — and arrest when they have probable cause that you are concealing evidence or have committed a crime. In either situation, the police should have a warrant! In which case, you should begin the encounter by telling the police, “I want a lawyer present and will not talk until a lawyer is present.” The police may not accommodate you, but, by saying that, you have laid down an important barrier. As difficult as it may be, REMAIN SILENT! Believe me, you cannot talk your way out of anything at this point. YOU NEED A LAWYER! Once you have asked for one, the police cannot question you, unless you start talking to them. If they do, what you said cannot be introduced against you in court. You must, however, be patient and prepared to wait quietly. The police must take you to court on the next business day. Remaining silent means shut up! A cellblock is no place to vent. Save it until you talk to your lawyer. The guy with whom you share that cell often has more substantial problems than you. He is just waiting to sell everything you tell him in exchange for a reduced sentence. Only talk to your lawyer: not your friends, not your parents, just your lawyer! I once compelled a mother to testify against her son in a murder case. The defendant pled guilty. Remember that! Finally, the reason you don’t see a lot of lawyers practicing law on street corners is because the street is not a courtroom. So, whether they are acting properly or not, don’t argue with the police in the street. Say one or more of the three things you should say and calmly repeat them in front of as many witnesses as possible. Say nothing more! Don’t be deterred by a police effort to secure your unspoken consent. They may try to convince you, trick you, or intimidate you. You must know your rights and be prepared to stand on them. If, after asking about your ability to leave, the police ignore your question and/or press you for identification, simply do what they are doing: repeat your question, “Am I being detained or am I free to go?”. If an officer has your license, registration, or insurance card promptly ask him to return them as soon as he comes back to your car. Don’t let the police detain you by holding onto your identification. Once the police are convinced that you’ll not consent, they will often begrudgingly tell you that you can go. If they exceed their authority, which police often do because they are poorly trained or bullies, stand your ground. But do so by calmly only saying one of the three things you have to say. You can sue the police for violating your Constitutional rights, but you can’t do that in the street. Try not to get hurt along the way. So, be disciplined and talk calmly; don’t get angry or belligerent. The police have a threat matrix which determines the amount of force they are entitled to use in any of these encounters. Their violence begins to escalate when you raise your voice. Once the confusion and violence start, the police have control. Your witnesses are, for instance, distracted. Remain calm! The police are trained to get their way, when they can. You have to train yourself to remain calm in these situations and to assert your Constitutional rights. The question has nothing to do with having something to hide. The issue has to do with protecting your individual freedoms. Once they are gone, very often they are simply gone, and you have put yourself in a difficult, often impossible, situation. Now, look at this example of an absolute abuse of authority: http://www.theatlantic.com/national/archive/2014/08/the-problem-is-im-black/379357/. View it to understand the abuse you can be subjected to for exercising your rights as an American. Nonetheless, you must assert your rights or suffer the consequence. The police department’s and police union’s responses in the accompanying article are pure erroneous jibber jabber. Whether white America realizes it or not, there is no subordinate class of Black Americans. Know your rights! More importantly, exercise them! Do you have a workplace challenge that involves conflict, tension, or some hindrance to optimum productivity? Submit your question or concern here. Check back on our blog to see if your issue is chosen to be addressed.